The BT-13B is the entry-level model in the Boytone family, but it has a generous list of popular features. 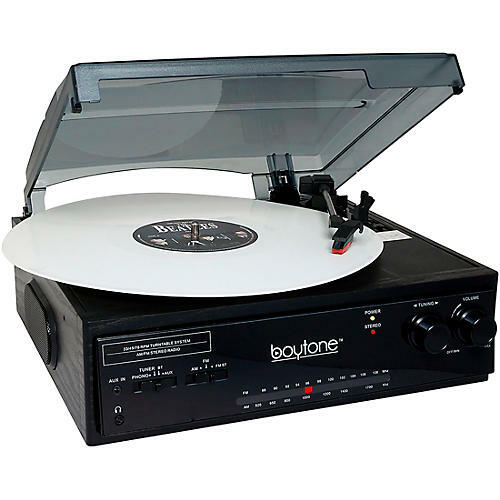 These include a 3-Speed turntable, Bluetooth connectivity to play music from Smart Phones, Tablets, and other Bluetooth enabled devices. It also has AUX-in, RCA line out and a 3.5mm headphone jack. Listening to vinyl, radio or Bluetooth-capable devices is easily done. A multi-function remote control makes it simple to access the BT-13Bs many features. The Boytone BT-13B with Bluetooth wireless technology follows the same design philosophy as Boytone’s higher-end models. With its handsome appearance, it has the most sought-after features of an all-in-one audio system, but at an extremely budget-friendly price. The turntable plays 33 1/3 LPs, 45 RPM vinyl records, as well as the pre-1950s 78 RPM shellac records. A sensitive AM/FM stereo radio and Auxiliary Input allows connection to other audio sources like a TV, DVD player, and other RCA-out equipped devices. Audio playback is through its internal full-range stereo speakers. A handy remote control allows you to quickly access and control many of the features of the BT-13B.